November was an unseasonably warm month this year in South Florida. Water temperatures remained in the mid 70s to low 80s. I recall this time last year we were fighting with water temperatures in the mid to high 60s. Given that the Florida Keys are a tropical place, the fish very much appreciated the warm weather sticking around. I spent the majority of November targeting bonefish. The flats offered many opportunities to stalk bonefish and we had great success. 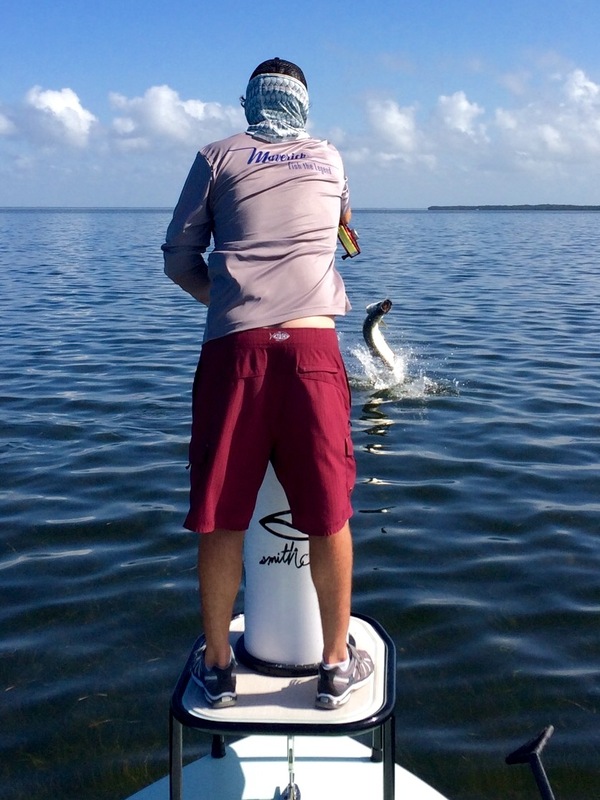 In addition to great bone fishing, a number of my colleagues reported days with excellent fly tarpon fishing. 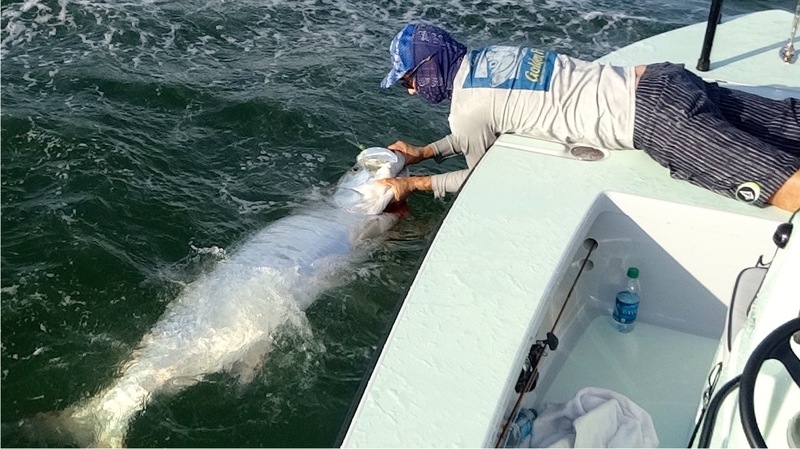 Some tarpon caught were reported to be in excess of 100lbs. As with any fishery, it really all depends on the weather. We finally experienced a mild cold front towards the end of November. When fronts move through, the wind is often blowing hard out of the north but the days are still gorgeous. On one such windy day, I guided Gayle and her son Nathan. Instead of forcing the idea of fishing the flats in all the wind, we ran back into the everglades to some sheltered grounds and caught snapper for lunch and a half dozen other species. If you are going to fish between November and February, flexibility on your target species is key to having an enjoyable time on the water. The snook barrage continued through the month of October. A large concentration of mullet pushed into the Florida Bay and Flamingo area, and with prey comes predators. If there is any advice I could give to the recreational angler, it would be to look for the bait. There were a number of times this October that I poled for hundreds of yards without seeing a scale. However, once I located the schools of mullet, the predator fish were always close by. The predominant species mixed in with the schools of mullet were snook, redfish, juvenile tarpon, and black drum. Although the black drum don’t feed off mullet, they are happy to eat a freshly peeled shrimp or a crushed blue crab. You can also target black drum on fly by using a small crab pattern, equipped with a rattler. September was another ridiculously good fishing month. We were blessed with the typical low wind conditions and my anglers took advantage of it. In preparation for fishing the Herman Lucerne Memorial Fishing Tournament, I spent a good deal of my September fishing in Everglades National Park. It was great to see how abundant the snook were. On a number of occasions when the water was clear enough, we spent most of the morning sight-casting snook on fly. Most of the fish we landed were in the 4-7lb range, but there were some larger fish mixed in as well. We also took advantage of multiple big schools of redfish. One of the pictures above is of myself and my angler Betsy doubled up with redfish on fly. This was one of six double headers we had that day. For anyone wondering about booking a charter in September, I have to tell you that this is my favorite month of the year to fish. Most of the hotels are operating at minimum capacity, the restaurants don’t require a reservation, and the flats aren’t packed full of flats skiffs. Although there is always a chance of a hurricane, most hotels and guides will refund your money in the event of a named storm. 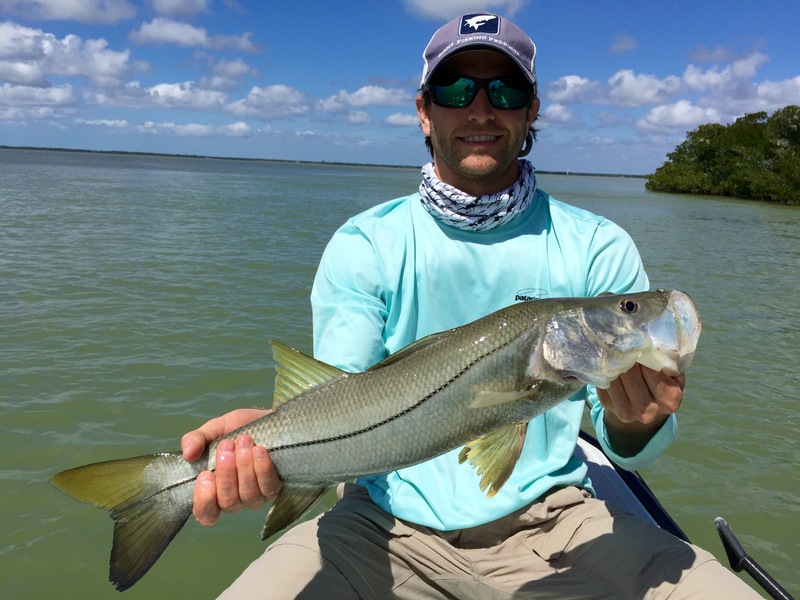 My favorite species to target in September are Bonefish, Permit, Tarpon, Redfish, and Snook. August was absolutely amazing in the Islamorada area this year. Diversity was the name of the game. It didn’t matter whether we were fishing right outside of Islamorada looking for bonefish and permit, or whether we ran back to the park to target snook, redfish and tarpon; the bite was on and we ate it up. Since August is great time of the year to target bonefish, I would like to take a moment to comment on the current state of our bonefish fishery. This August I saw more bonefish on and around the flats than I have seen in years. In my humble opinion, I think the bonefish are making a comeback in South Florida. The numbers of juvenile bonefish have spiked dramatically. I can only hope that over the next few years we continue to see the fishery rebound even more. It is very exciting from the perspective of someone like myself that absolutely loves to stalk bonefish on the flats. One other thing worth commenting on is the juvenile tarpon population. Anyone that fished in and around Flamingo this past summer/fall will tell you that the juvenile tarpon fishery is flourishing. I had many enjoyable mornings catching 10-20lb. tarpon on fly with my clients. These fish are a ball to target on 7-9wt. fly rods. This will be quite a redundant point over the next few posts, but I absolutely love fishing during the months of July, August, and September. The first thing everyone asks me is, “isn’t it just so hot during that time of the year?” Well, I have to admit that it can be hot; but the fishing can be as good as we will see it all year. One big change we see in July is the permit return to the flats after they have been spawning on the offshore wrecks for the past 2-3 months. Sight-fishing for permit on the flats is a blast. Most of the time you will find these fish mudding just like a bonefish would. Although I prefer to target permit in 2-4 feet of water, permit will get in super shallow water and tail like a bonefish. July is also a great time of the year to head back into Everglades National Park and target redfish and snook. In July, there are massive schools of tailing redfish all over the grass flats. For inexperienced fly anglers looking for target practice, or experienced anglers looking to have some fun, the July red-fishery is phenomenal. Most of the fish are found tailing in super shallow water. The average size is 5-7lbs, although we are seeing more and more redfish in the 10lb. range. 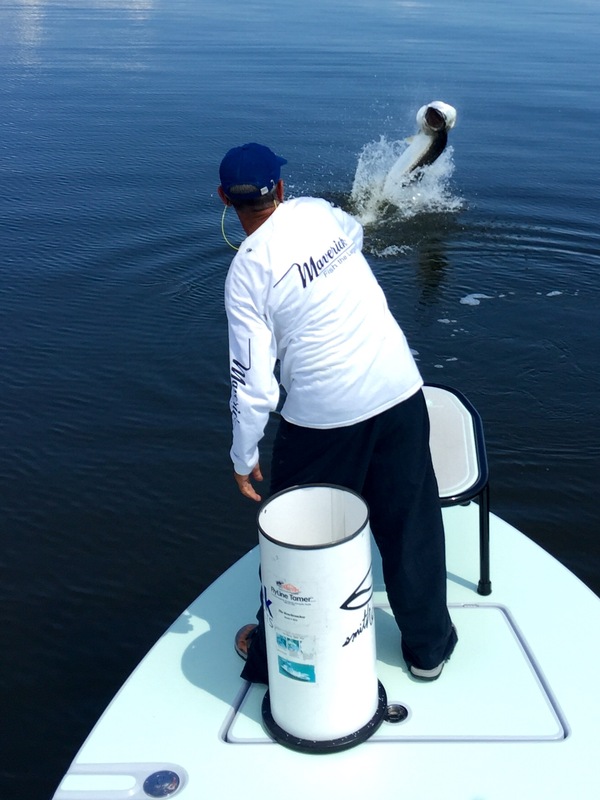 The months of April through June are typically when all my anglers want to focus on tarpon. I have to admit, these are great months to do so, but there can also be some great bone-fishing as well. This whopper, downtown Islamorada bonefish seen above, was caught by Ted in April. We actually jumped two tarpon on fly prior to landing this bonefish. April, May, and June are the primary migration months for tarpon in the Florida Keys. Although we will see some migrational patters as early as late February or early March, most of the time the first consistent signs of the migration occur in April. As with any kind of fishing, it really all depends on the weather. If you already have a fishing trip planned in February or March, maybe it is best to wait and see what the weather will be like before you decide on a particular species. Let your guide know that ultimately, you would like to target tarpon during your trip. If the weather lends itself to doing so, your guide will be the first person to let you know. If you are planning a trip and want to focus strictly on tarpon, whether it be on spin tackle or on fly tackle, you are better advised to visit the keys between the months of April and June. MARCH was the month of the tarpon. We were fortunate enough to have a long stretch of days where the wind laid down and offered us warmer water temperatures and absolutely perfect tarpon conditions. One of the things that a fishing guide battles in March is the wind. Historically, March is one of the windiest months of the year. Anglers that book trips in March have to be flexible as to what species they will target. In the event a cold front hits, sight fishing for tarpon will not resume until the water temperatures start to warm back up and the winds subside. That is exactly what happened with Scotty and his dad while they were visiting. Instead of beating our heads against a wall, we went deep into the backcountry and caught snook, sharks, and tripletail. Being flexible can make or break your fishing trip. Some days conditions for the primary sought-after species just do not line up. I appreciate clients that allow me to make alternative suggestions and give us a chance to have an enjoyable experience.